Have you heard that expression “once in a blue moon”? It originally referred to the extra moon in a season – we would expect to have three full moons per season but every so often, there’s a fourth one and this was called the blue moon. In 1946, a magazine reported, in error, that a blue moon is when there is a second full moon in one month and so now, both definitions are used. A blue moon only happens on average once every 2.7 years, inspiring the expression “once in blue moon”. Tonight at the official time of 9:59 Eastern, we will experience a blue moon. There won’t be another one until July of 2015! To celebrate the blue moon with all of our Charity Wings’ friends, we have a special deal for you. For every $5 of “Stop to Smell the Flowers” raffle tickets you buy by tonight at 11:59 Pacific time, we will give you an extra free ticket! Check out all the details about this raffle and buy your tickets here. Charity Wings will be participating in Creative Cynchronicity's "World Card Making Day" activities on October 6-7, 2012. This event will feature fantastic designers with demos every half hour that will inspire you to create! Each designer will have a giveaway at the end of their demo so be sure to log in to be automatically entered to win! As part of this event, we’re hosting a raffle called "Stop to Smell the flowers with Charity Wings" to benefit the Charity Wings Art Center. Each day of this two day event, we’ll draw from these raffle tickets and the winner will receive an amazing prize pack filled with all sorts of flower themed supplies! The entire line of one of Prima's new releases from Summer CHA $100 value. Here’s an update to our LIVE from CHA Logo Contest entries! Are you working on yours? We would so love to see it! To enter: use the LIVE from CHA logo die cut received with your tickets in the mail and email us a photo of what you’ve made to info@charitywings.org. We’ll post it to the blog and randomly choose 3 winners to receive a $50 gift certificate from Paper Wizard! DEADLINE EXTENDED: We have extended the deadline to September 30th so that those of you who have just received your logo still have lots of time to submit an entry! Don’t forget – on top of providing these fantastic prizes for this giveaway, the amazing Paper Wizard is also offering a special deal to all of our wonderful Charity Wings' supporters. When shopping at the Paper Wizard website, use the discount code CROP20 to receive 20% off orders of $40.00 or more. Thank you so much for your continuing support of Charity Wings! You mean the world to us! And thanks again to Paper Wizard! Have You Joined Club TLC Yet? 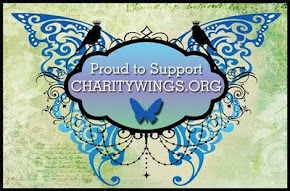 Charity Wings' Club TLC is a community of creative people doing good deeds "Through Love & Creativity". As a community we will share our experiences and ideas and inspire each other to give back. Its a fun and creative way to earn your "wings". Club TLC is a community of creative people doing good deeds "Through Love & Creativity". As a community we will share our experiences and ideas and inspire each other to give back. Its a fun and creative way to earn your "wings". Save up and exchange your points for great gifts from amazing sponsors. Keep reading to find out all the special perks you will receive just for becoming a member. Exclusive Club T.L.C signed 5x7 print, "Gift of an Angel" by Danita Art. Check out Danitas art at DanitaArt.com. Membership kit including personalized membership card and handmade charm. 2 Free raffle tickets (min $10 value) for the Quarterly Charity of Choice Raffle. Monthly on line chats in the Charity Wings Parlour with special guests and giveaways. Facebook Community to share your good deeds and inspire others. Just for signing up you are getting $79 worth of goodies which doesn't include all of the bonuses you can collect throughout the year. What a great deal! Head on over to our webpage to sign up! Graphic 45 donated to us THE AMAZING HANDMADE HAPPY HAUNTINGS CLOCK handmade by the Graphic 45 design team!! If you were at CHA Chicago 2012 and you saw this clock at the Graphic 45 booth - now is your chance to OWN this amazing piece. Great for fall decorating and Halloween parties you can display this fun and functional item from September through October 31st or all year long in your craft room! Clock dimensions are 37" tall, 5"wide and 20" across. Head on over to our Ebay page to see more pictures and details. Chicagoland Scrapbooker Magazine, a free quarterly publication for papercrafters in the Illinois, Indiana, and Wisconsin Area, is launching with the FALL 2012 issue and will be available at paper crafting retailers and events in the tri-state area. At CHA, they donated to us an autographed MLB baseball signed by 3rd Baseman of the Chicago cubs Ian Stewart valued at $100. They have the certificate of authenticity from the Chicago Cubs headquarters and it’s included in a black frame. The ball is contained in a nice display case. Check out our Ebay page to learn more and place your bids. The Rubber Cafe have donated to us the brand new On the Fence bundle which includes a 3 stamp set with Spellbinders die exclusive. Retail value $69.99. This picture doesn’t even do it justice – go to our Ebay page to find more pictures and full details. Place your bids now! Have you checked out our latest Ebay auctions? Head on over to our Ebay page for your chance to bid on these fabulous items! Check out the listings on Ebay for full details. Hurry – only a few days left to bid on these items and help raise money for Charity Wings! Have you entered yet??? All you need to do is to make something using the super cute LIVE from CHA logo die cut you got with your tickets in the mail and email us a picture of what you create to info@charitywings.org. We’ll post it on our website and randomly choose 3 winners to receive a $50 gift certificate from Paper Wizard! DEADLINE EXTENDED: We will be extending the August 31st deadline to submit entries. We had such an overwhelming response to the LIVE from CHA event that Paper Wizard is working overtime to cut out more of these die-cuts so we are still sending them out to some of you. If you haven’t received yours yet, don’t worry! It’s coming very soon and now you have plenty of time to enter this giveaway for your chance to win! Thanks so much to Paper Wizard for their continuing support of Charity Wings! Wanna Be a Cover Girl/Guy? Hey there, wanna be a Cover Girl/Guy? Well, have we got an opportunity for you!!! 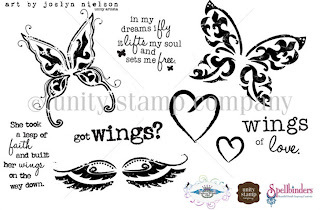 Charity Wings, Unity Stamp Co. and Spellbinders Paper Arts LLC are looking for fun, original art showcasing the "Fly with Wings of Hope" stamp set and the "Wings of Hope"Die/Emboss/Stencil Set. Submit photos for your chance to become the new cover photo for our Charity Wings Facebook Fan Page! 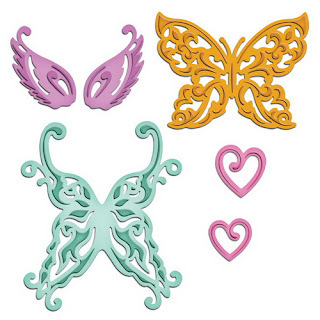 First place winner will receive a $75 prize pack from Unity Stamps and the fabulous Spellbinders Classic Scallop Edgeabilities, Ric Rac Edgeabilities and Classic Decorative Inserts One (MSRP $60) and of course, their artwork will become the new Charity Wings Cover Photo! Two runner-up winners each will receive a $40 prize pack from Unity Stamps and Spellbinders Labels Twenty-Four Nestabilities (MSRP $25.00). The contest runs August 1-September 30, 2012 so be sure to have pictures of your artwork emailed to us by 11:59 pm Pacific time on September 30th. You may choose to incorporate our name, Charity Wings, into your artwork or we will Photoshop it in after. Send your emails to info@charitywings.org with the subject line "CoverGirl/Guy Contest". Everyone is eligible to win, however, winners agree to donate their art to Charity Wings where they will become part of the Charity Wings' Wing Art Gallery that travels to shows and events all over the country! Winners’ artwork must be received by October 31, 2012. We can’t wait to see your Wings of Hope artwork!